The probing eye of the motion picture camera has covered every spot of the globe but there seems always to be something new and amazing going on behind the world's many doors. Macabro, which is Italian for macabre, opens more of these doors and reveals more of the strange sights and sounds initially brought to American movie audiences in such films as "Mondo Cane", "Taboos of the World" and "Ecco". 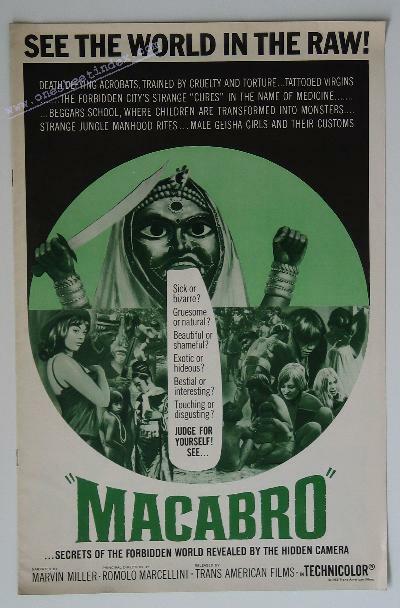 Produced in vivid color from the most unusual series of filmed sequences ever assembled, Macabro zooms its telephoto lens into the secret rituals of a gypsy tribe where tiny children are mauled and their limbs painfully manipulated until they are able to perform incredible acrobatic feats for which watchers give them coins to fill the tribal coffers. Narrated by Hollywood actor Marvin Miller, the full length shock documentary invades both the surgical operating room and the Leprosarium; African tribal rites and Middle Eastern religious rites. of a shortage of females in the profession. In Brazil, the recreational wrestling rites of head-hunting Indians are rolled across the silver screen. A pair of beautiful secretaries who frequent a restaurant where they select and eat a live snake for lunch, and an aged man who hunts turtles in order to drink the hot blood and devour the warm entrails hoping to regain his lost youth and virility are among the fantastic practices disclosed in Macabro. Perhaps most startling of all are sequences showing how some of the world's primitive healers perform their miracles. One shows inch-long bamboo shoots being inserted into the body and then lighted like incense to cure the affected area. Another shows a healer dangling a live mouse before a woman's mouth to cure a migraine headache. Amusing is the Oriental practice of massaging its most beautiful and affluent women with a special sea weed, and enlightening is the Italian practice of hanging young children on parade floats as if they were decorations on a Christmas tree. Some housewives will be delighted to see the men of India at work washing clothes, and others will be touched by a camera's-eye view of the induction of a young beauty into a Buddhist convent. A frightening commentary upon the tempo of modern times is recorded in a visit to a Scandinavian coffee house where bored young adults sit all night in silence, waiting for the dawn whereupon they race to the train tracks to play a form of railway roulette in which they neck while the engine bears down on them. And yet this is not so frightening as the act of an African sorcerer who toys with a live cobra and then puts the reptile's head into his mouth to give movie audiences viewing Macabro thrills they have never experienced before.